The president and secretary general of CMAS visit Sweden and The Swedish historical diving society. 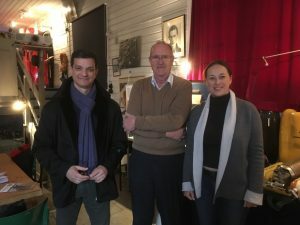 In conjunction to the annual Diving exhibition in Stockholm, CMAS president Anna Arzhanova and CMAS secretary general Hassan Baccouche visited the Swedish sportsdiving fereration, SSDF, and The Swedish historical diving society, SDHF. The SDHF, is housed in the building of the old escape training tower, abandoned by the navy in 1979. The host at the visit was Dr Hans Ornhagen, consulting doctor at the Swedish sportsdiving federation, and also one of those who rescued the old house from demolition after the navy had moved. The house today contains, not only the original hardware the escape training tank and a 10 bar recompression chamber with wet pot from 1934, but also all kind of diving equipment collected during the years. As an example the recoil free water nozzle (see picture), invented in the early forties by Arne Zetterstrom, was presented as a preparation for and introduction to the following visit to the Vasa museum displaying the 17th century warship Vasa, salvaged in 1961 after more than 300 years at the bottom of Stockholm harbor. The tunnels for the hoisting cables under the ship were made by helmet divers using the Zetterstrom nozzle. Arne Zetterstrom was not only the inventor of tools for divers, he was also the man behind the first dives with hyrox in the open sea in 1945. 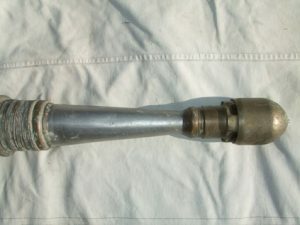 Hydrox, a mix of Oxygen and Hydrogen, in proportions that makes it fire safe, was believed by Zetterstrom to be a substitute for heliox in deep diving when helium was not available, as in Sweden during the war. The sad story is that the young Zetterstrom, only 28 years old, was killed during an experimental dive because of a mistake that had nothing to do with the exotic breathing gas or the new decompression tables for deep bounce diving. The tragic dive was the fourth in a series of successively deeper dives made from the submarine rescue ship HMS Belos. The dive station was located at the crane for the diving platform at the aft of the ship. To prevent the platform from spinning around, when hanging at the end of a 165m long wire, a guy (a thin line) was mounted at one of the corners of the platform and up to a winch at the bow of the ship. Two conscripts, who had not been onboard during the earlier dives and consequently were not trained and informed enough got the job to handle the guy winch with the order to keep the guy tight without slack. 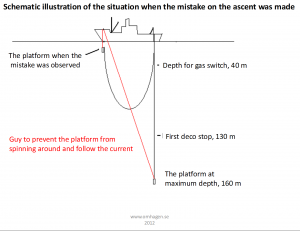 They had no training in diving and did not understand that an ascent from a deep dive has to be done slowly and in steps so when the order was given onboard “The diver is coming up” the two at the guy winch started to take in their line. All the others understood that coming up meant “to the first stop at 120m” so the main crane hoisting the platform stopped when the wire was at the 120m mark. Zettersrom signaled OK and because of the hydrogen communication was difficult and not too many words were exchanged. What the diving supervisor did notice was that the two at the guy winch continued to take in line. Their task was to “take in the line and keep it tight” and the diver was on his way to the surface so they did what they had been told. When Zettrerstrom did not respond to questions at a later decompression stop the diving supervisor realized that something must be wrong. His attention was brought to the fact that the hoisting wire seemed less tense than earlier during the dive while the guy wire was very tight and they found the platform hanging just below the bow of the ship. 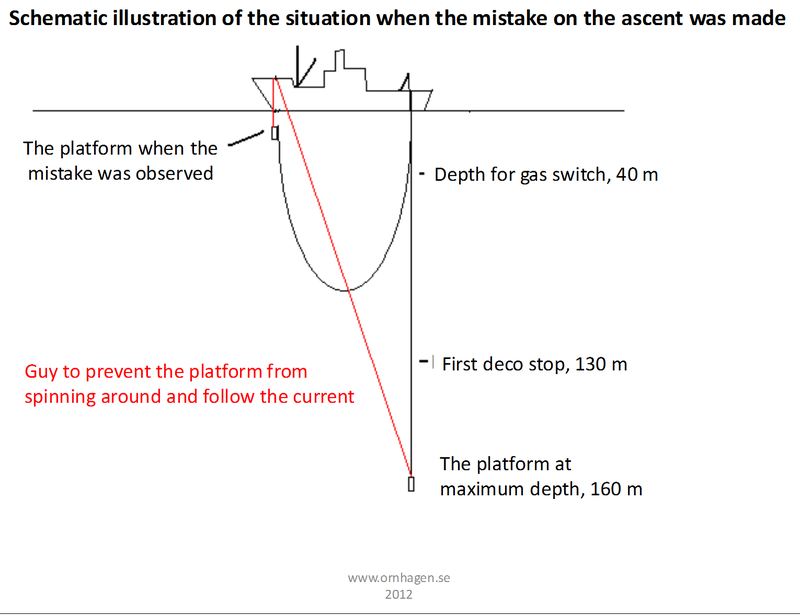 Zetterstrom was unconscious on the platform according to a stand by diver sent down to the platform. He followed the platform when it was lowered to 50 m. No improvement could be seen I the status of Zetterstrom and he was hoisted quickly to the surface to be placed in a recompression chamber together with the diving doctor. Despite vigorous efforts by the doctor Zetterstrom could not be brought back to life. Everybody onboard with knowledge in diving understood that Zetterström had become unconscious when the hydrox was not changed for a gas with higher oxygen content and he could therefore not signal any problem when the decompression illness struck because of the abandoned decompression stops. A combination of hypoxia and severe decompression sickness killed Zetterstrom. A court marchal came to the conclusion that there was no one to blame because of the complex situation with a mixed crew and novel technology. The hydrox diving project was stopped. It was not until 1979 the French diving company COMEX tried hydrox in diving and the Swedish navy made hydrox exposures in chamber dives in 1983. Both COMEX and The Swedish Navy found in their experiments that hydrogen was too narcotic for use in deep diving.